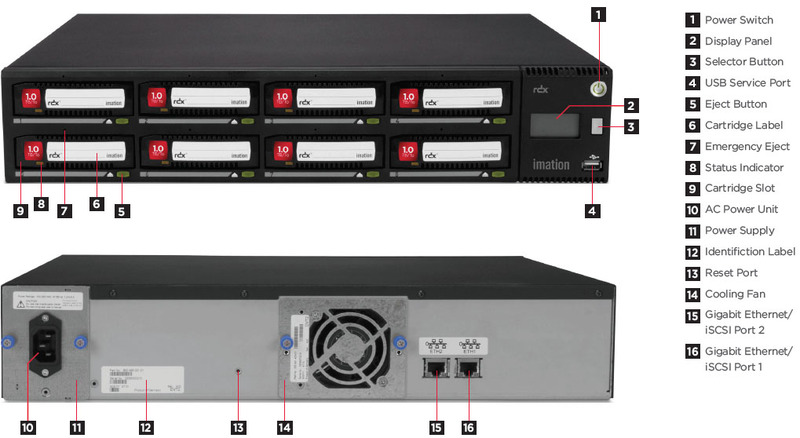 This multi-bay device offers backward and forward compatibility with all RDX cartridges, plus iSCSI-based networking and desktop or rackmount options. Cartridges range from 160GB to 1TB, for a total capacity of up to 8TB (up to eight 1 TB cartridges) of online and unlimited offline capacity. As RDX cartridge capacity grows, so will your data storage capabilities. Combining large capacity and high performance, the A8 can handle the most demanding data storage needs of small- and medium-sized businesses – and still have room to grow. Operating in Tape Emulation mode, the A8 functions as a single drive, spanning all available cartridges to provide seamless handling of large data sets. In JBOD mode, the A8 gives you a separate drive letter for each bay.